Beatrex Quntanna is a dynamic teacher devoted to the growth and development of the human potential. She inspires, motivates, and stimulates growth with her ever present zest for life and the human experience. Beatrex is an author, poet, lecturer, symbolist and Tarot expert. She has been counseling and teaching for the past 20 years using the Tarot as an enhancement for personal and intuitive development. Her students find her workshops and books inspiring, enlightening, full of wise truths, and helpful in pursuing the most positive outcome in their own lives. 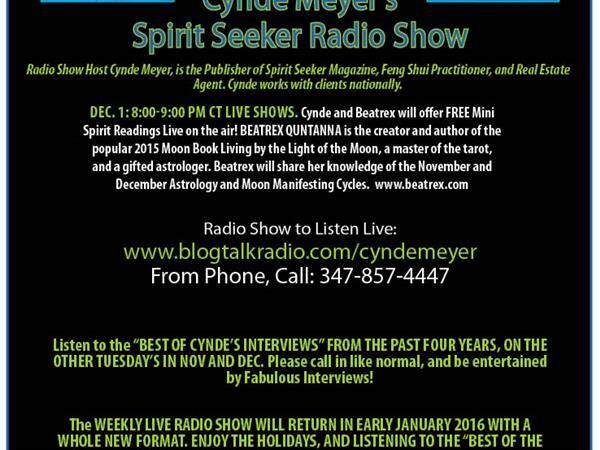 For the last 19 years, Cynde has served as the CEO, founder and publisher of Spirit Seeker Magazine, a monthly resource for the Mind, Body and Spirit. She is a weekly radio show host, and has interviewed some of the top authors in the area of Mind, Body and Spirit, including Wayne Dyer, Esther Hicks, don Miguel Ruiz, Marianne Williamson, Dr. & Master Zhi Gang Sha, Dr. Pillai, Doreen Virtue, John Edward, and James Van Praagh.